What shows your Cedar Crest College pride wherever you drive, is more permanent than a bumper sticker, and has more visibility than a window decal? A Cedar Crest College license plate! Cedar Crest College alumnae, faculty, staff, parents and students who are Pennsylvania residents have the opportunity to "ride with pride" with a Cedar Crest College license plate. The Ride with Pride license plate program was initiated to raise our brand awareness in the community. Proceeds benefit programs sponsored by the Alumnae Association for alumnae and students. To participate, you purchase a special Cedar Crest College plate at a cost of $63 to replace your standard state license plate. Of this cost, $31 goes directly to the Alumnae Association as a tax-deductible donation. In Pennsylvania, specialty plates are currently available for passenger cars and trucks with a registered gross weight of 10,000 pounds or less. Specialty plates are not available for motorcycles and trailers. “Personalized” plates are not available. 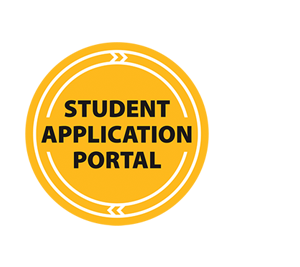 Click here to download and print the application form. You must complete sections A & E, return the application form with your payment (a check for $37 payable to Cedar Crest College Alumnae Association and a check for $26 payable to PennDot), to the Cedar Crest College Alumnae Office, 100 College Drive, Allentown, PA 18104. All applications for this speciality plate must come directly from the Alumnae Office. 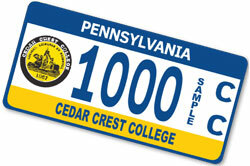 It is now possible to personalize your Cedar Crest plate (for example: CCC '89) for an additional charge of $104 and the completion of section D.
If you have any questions about the Cedar Crest College license plate, please contact the Alumnae Office at 610-606-4609, or toll-free at 888-902-3327, or e-mail alumnae@cedarcrest.edu.